We had an excellent meeting on Wednesday 13 March and discussed a range of ideas. The room was full of enthusiasm and ideas which was wonderful. We are holding our first disco of the year on Friday 3 May and our Mothers Day Stall is on Thursday 9 May. We would love some help, so if you are keen to have a bit of fun and get to know some faces around the school, you will be welcomed with open arms. Please email us with your interest. Are you a nutritionist? We are looking for parents and carers that we might be able to engage with for talks throughout the year for parent and student support across a range of topics that are real and relevant in our daily lives. If you have something to offer, we would love to hear from you. 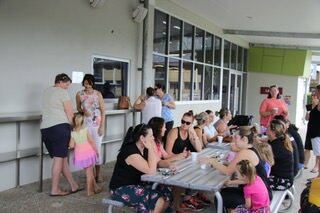 Our very first catch up for a cuppa was a great success and we will have our second one in the second week of Term 2 on Wednesday 1 May after school drop off in the morning. We will get a flyer out for that shortly. We are excited to have locked in Saturday 13 June 2020 for our Funfest next year and we are looking for a team to collaborate with to make Funfest another epic day out for the kids. Email your interest through and remember that many hands make light work. It is a group effort so you won’t be overwhelmed. This entry was posted in P and F and tagged funfest 2020 on March 20, 2019 by sandy.